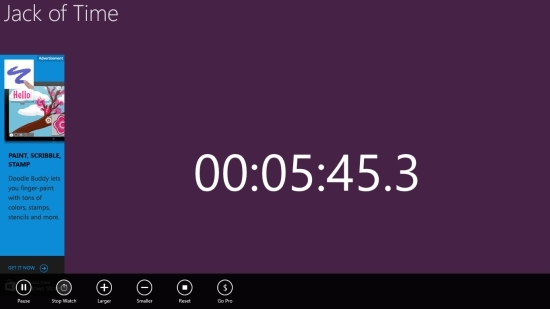 Jack of Time is a free Windows 8 Multi-gadget Clock app that displays time, and also has inbuilt Countdown Timer and Stopwatch within it. Very appropriately named as Jack of Time, the app offers a variety of time tracking devices that can be used for various purposes. 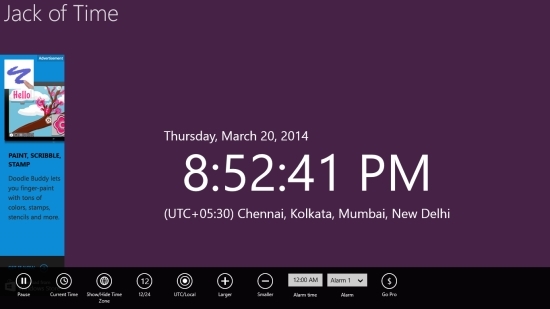 This free Windows 8 app displays current time in local time zone or UTC. You can also use it to create a countdown timer with a toast message and audible alert. The third important utility function of the app is that it provides you with a suspendable stopwatch. Jack of Time is freely available in Productivity category of Windows Store. You can view the app directly in Windows Store by clicking on the link given below at the end. 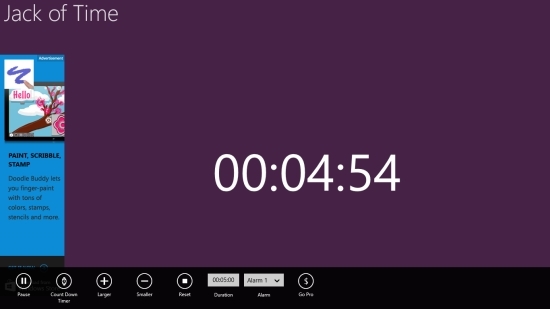 Let’s see how you to use this free Windows 8 Multi-gadget Clock app. To use this Free Windows 8 Multi-gadget clock app, you first need to install it on your Windows 8 system. The Main screen of the app will display clock by default. You will see the current time in local time zone and UTC along with current day and date details. The time is displayed in digital mode showing hour, minute, and second updates. With a right click on the screen, the app bar will appear showing various options. These options include Pause, Current Time, Show/ Hide Time Zone, 12/ 24, UTC/ Local, Larger, Smaller, Alarm Time, and Alarm. Current Time option is to access the other two gadgets of the app(This option will toggle between Current Time, Countdown Timer, Stopwatch on mouse click). You can set 12 hour clock or 24 hour clock to display time using 12/ 24 option. UTC/ Local option gives you the choice to display local time or UTC time on the app’s clock. Show/Hide Time Zone option lets you display or hide UTC time zone. Larger and Smaller options are to adjust the font size of clock display. You can also use Alarm Time and Alarm options displayed on the app’s bar to set alarm in the app. As you click on Current Time option on the app’s bar, the clock will turn into a Countdown Timer. The app bar will display options Pause, Countdown Timer, Larger, Smaller, Reset, Duration, and Alarm. You can set the duration of the timer manually and select alarm tone using the dropdown provided in Alarm option. Now, click on Reset button. Your Countdown Timer will start. As the set time is reached, a message will pop up on your screen with an audible alert, no matter if the app is open or not. As you click on Countdown Timer option displayed on the app’s bar, Stopwatch will show up and start counting the time. The app bar will now display options Pause, Stop Watch, Larger, Smaller, and Reset. You can click on Reset button to set the Stopwatch again to record time. Similar apps: Ultra Stopwatch & Timer, Metro Toolbox. Jack of Time is a nice package of a variety of time tracking tools. It gives you clock, Countdown Timer, and Stopwatch in a single app. However, I found ‘pinning to Start screen’ option missing. Having this option would have added to the utility value of the app. But otherwise, a nice handy app. Try this out and share your feedback via comments. Get Jack of Time here!